You may have heard the terms point and nonpoint source pollution. To demystify these terms a bit, a point source is a known source of pollutants, such as a factory or a sewer treatment plant. Nonpoint sources are everything else: lawns, roofs, construction sites, driveways, and roads. Pollution from these sources can take a variety of forms, including mud, bacteria, fertilizers, and toxic waste like oil and paint. Stormwater collects these pollutants from multiple sources, then introduces them directly into our streams, rivers, and lakes. In many places, nonpoint source pollution is the biggest threat to local waterways. In cities and towns where the drainage system is separate from the sewer, all storm water enters lakes and rives untreated. Combined systems can have problems too: system back-ups result in an even more hazardous mess. Either way, it’s important for individuals to keep storm water as clean as possible. Nonpoint source pollution is hugely affected by individual behaviors, and there are a few key things people can do to prevent pollutants from reaching local waterways. 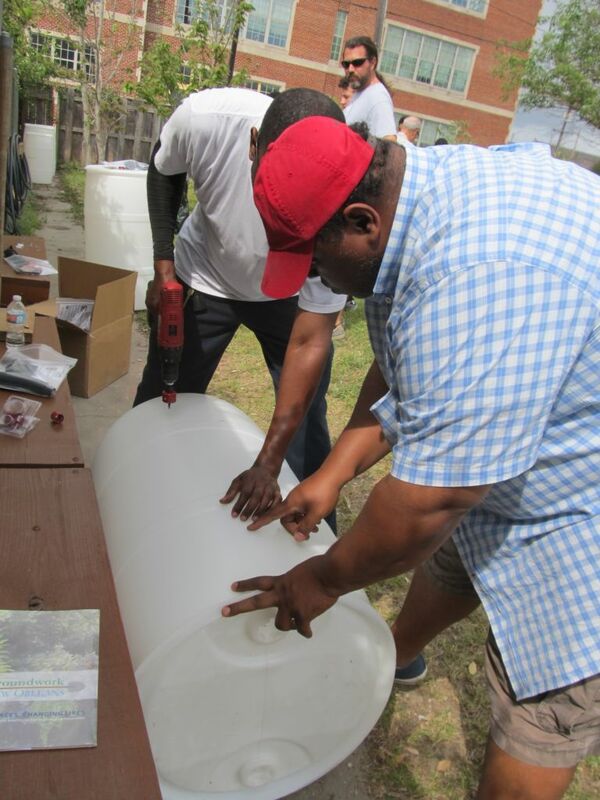 Workshop attendees build their own rain barrels in New Orleans, LA. Syrup barrel donated by Crescent City Coca-Cola. Captured stormwater can be used to water lawns, wash cars, and more — pretty much anything that doesn’t require potable water. One of the easiest and most popular forms of water catchment is the rain barrel. River Network has teamed up with Coca-Cola and Rain Barrel Depot to promote the use of rain barrels nationwide and provide non-profits with promotional support and materials to host their own workshops. If you don’t have one of these workshops near you, it is easy to put one together. All you need is a food-grade barrel–sometimes you can buy them for cheap from local grocery stores–and a rain barrel kit. Rain barrels provide many benefits. They help to preserve fresh water, and therefore, reduce your water bill. They can keep stormwater from pooling and collecting additional contaminants. And by using the water in your garden, you return the water gradually into the soil, allowing plant roots to filter out toxins before they reach the groundwater system. Rain barrels are effective because they passively capture rainwater and can function well in a variety of situations, for both homeowners and renters. They can be connected directly to one’s downspout as a high-pressure closed system and used for irrigation; or, they can be assembled as open-top barrels, and left out in the rain to collect as much water as possible. Farmers also use them for small- and large-scale irrigation. Multiple barrels can be hooked together to provide a high-pressure, passive system that funnels rain water directly to your raised beds. For more great information about rain barrels, visit this page on the EPA website! Flow-through planters are also a great option. A flow-through planter is like a rain barrel, in that it can be attached to a downspout, but it is open and contains garden soil and plants. The plants absorb the storm water directly and filter out toxins. Excess storm water gets released through an overflow valve. You can buy one pre-made, or you can make one out of an old clawfoot tub or similar container. Rain barrels are considered a type of green infrastructure, because they help to mimic and enhance existing natural processes. There are other types of green infrastructure that individuals can implement in order to manage storm water and reduce pollutants entering local waterways. These include rain gardens, green roofs, and more. By itself, one rain garden or rain barrel can have a direct impact on your individual property by protecting your foundation from storm water, keeping pollutants out of your storm drain, and watering your plants. When municipalities implement multiple types of green infrastructure on a large scale, these combine to form a much bigger impact, especially if they are planned smartly as one cohesive system. This is where it becomes important to become active on the policy level, and by implementing green infrastructure at home, you can demonstrate the benefits to public officials — and to your neighbors. I really liked your project, I think this is an eco-friendly project, Um looking forward to buying a water barrel for my garden. Thanks for sharing this post.